What does the term "kicker" mean in poker? 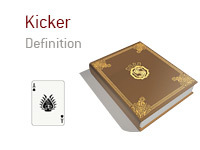 What is the definition of the term "kicker" in poker? In poker, the "kicker" is the highest unpaired card that is in a player's hand. The "kicker" is often used to determine the winner in a hand. For instance - let's say that you are playing in a $1/$2 No Limit Hold'em game at your local casino. Action folds around to you on the button, and you put in a standard raise holding Ad-Kd. The small blind calls and the big blind folds. The flop comes Ah-3h-7s, giving you a pair of Aces, top Kicker (The King is the best possible kicker in this case). The SB checks, you bet and he calls. The turn brings the Jh. Again, there is a check, bet and call. The river brings the 9s. Once again, he checks, you bet and he calls. Your opponent turns over As-Qh for a pair of Aces with a Queen kicker, while you flip over your Ad-Kd. Now, you both have a pair of Aces, so who wins the hand? The answer? You do, as you have the better kicker. Your unpaired card is a King, while his unpaired card is a Queen, so you win the hand outright. Isaac "philivey2694" Haxton Wins First Pokerstars "Superstar Showdown"